It’s called the VOR Time Check and allows you to estimate the amount of time required to cross a VOR while flying a radial. 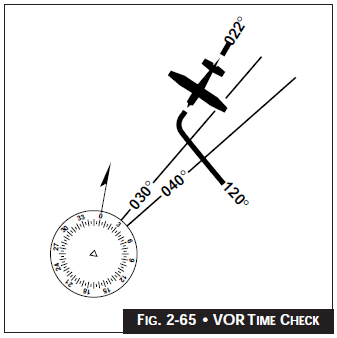 Let’s say you’re flying the 022 degree radial towards the VOR. Select a radial that is divisible by 10, so the 030 radial in this case. (Trying to do this with the 020 radial, only being a 2 degree difference would be difficult). Now fly to that radial so that it you will cut it at a right angle (in this example, fly a heading of 120 degrees). As soon as you cross the 030 degree radial, start the clock. Stay on your heading, and fly to the 040 degree radial. Recording how long it takes you to get there. 120 seconds (2 minutes) / 10 = 12 Minutes to the VOR station. This surely would be handy back in the day before the advent of the GPS. Does anyone use this any more? Is it really worth spending the extra time flying “away” from the VOR to calculate this? Maybe if you were lost and low on fuel…but also if you are low altitude the signal reception distance would be a good hint to how far away and thus maybe a guesstimate of how long based on pre flight planning using the ASEP function to have a visual idea of where the winds are from. My flight instructor taught me that technique to get a position estimate while VFR. I learned in BC where, especially at that time, you were lucky to receive 1 VOR station. Like Adam, I can’t see it having much application in the modern IFR system, but you never know what might save your bacon sometime. Interestingly, hidden in this little trick is the 1-in-60 rule.